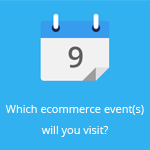 May 4, 2017 by Ecommerce News. About Mobile with tags Germany. 12589 views. It looks like mcommerce in Germany is finally catching up. Although the usage of mobile devices for buying online and paying in-store in Germany is still lagging behind other big ecommerce countries, predictions look hopeful. In Germany, 29 million mobile users will buy online via a mobile device at least once this year, up nearly 15 percent from last year. This is the forecast of market research company eMarketer. It states that mcommerce has been slow to catch on in Germany, where consumers still prefer to pay with cash, but mobile commerce is growing steadily with consumers getting accustomed to buy and pay for products using their mobile device. The company predicts 29.1 million mobile device users in Germany will make at least once purchase via a smartphone or tablet this year, which would mean an increase of almost 15 percent compared to last year. This number represents about 60 percent of the country’s mobile device users. In view of this, Germany is still behind the United States (80.4) and the United Kingdom (76.4 percent). In Germany, the smartphone is way more popular than the tablet when it comes to shopping online: 71.7 percent of mobile shoppers will make one or more mobile purchases using a smartphone during this year, compared to just 46.5 percent who will turn to tablets for mcommerce. The smartphone usage rate of 71.7 percent in Germany is higher than the 64.6 percent of American mobile device buyers who are expected to shop using their smartphones. 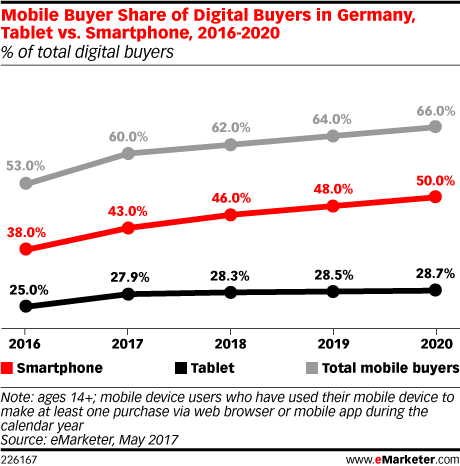 eMarketer also thinks 11.4 percent of mobile users in Germany will make an in-store payment with their smartphone this year. For comparison: in the United States, the percentage will probably be 20.5 percent. Nevertheless, if the predictions come true, the number of mobile proximity payment users in Germany will have grown 21.6 percent to reach almost 7.3 million by the end of this year. And if this growth continues, there will be 11 million of them in 2020.